It was the day after my last exam for the quarter. I was sat having coffee with a friend, telling her how excited I was to take a much needed break from all the stress I was under at the time. Bahrain was experiencing a lot of political instability, to say the least, and I was struggling to balance between paying attention in class and surfing the web for the latest news on the protests back home. Mid-meeting, I get a call. “Yara, did your dad get arrested?” my friend said. I called my mother, her phone was busy. It was past 1am in Bahrain. My heart was racing. I called my sister who works in Dubai. She was asleep and hadn’t heard anything. Finally my mother calls back and confirms the news. My father, Ebrahim Sharif, of the National Democratic Action Society, had been arrested in the middle of the night. I ask her to tell me exactly what happened as I whip out my laptop and start typing her account of the arrest in English to post it on my Twitter account. Back then I had about 150 followers. It jumped to over 1,000 in just a few days. This is a link to what was written and posted. That’s when my life started to really change. For the first month or two, I didn’t know where my father was. The way he was taken away from my mother gave me a feeling that he was not safe. I immediately withdrew from all of my classes for the next quarter; I knew I wouldn’t be able to handle it. My family advised me not to come back that quarter, no one knew what was going to happen and didn’t want to risk it. I cancelled my spring break plans and flew to a trusted friend in the US. I spent three weeks with my friend not knowing how to feel. How was I supposed to feel? Depressed? Helpless? Those are not feelings my father had encouraged. Strong? Focused? That is easier said than done. I remained strong, talking to reporters who contacted me via phone and email and finding ways for them to reach my mother while she was busy doing the same. Still, it was my father this was happening to, it was my family, it was me. My life had changed and not in a good way. Not in a way a 20-year-old international business student expects. The cold weather didn’t encourage me to leave the house or socialize either, so for a while I felt like my world was crumbling – something I wasn’t used to, at least not to this degree. Fast forward six months. I am now in Bahrain. I’ve seen my father twice, once at a family visitation day and once during the first day of the appeal process for his five-year sentence. I still don’t know how to feel about it all. He knows how to calm my heart, but I know what he went through. He spent about two months in solitary confinement. He was verbally and physically abused by masked men. Slapped, kicked, disrespected and beaten with a hose. He stood for hours with his hands in the air in a corner, profanity surrounding him. My grandmother’s honour was insulted along with one of the two main religious sects in Bahrain. Can you imagine going through this, all alone for so long, with no access to a lawyer or phone calls to loved ones? And all for what? Because he demanded a constitutional monarchy? I don’t see the correlation. My words may seem composed but it has been an emotional struggle; he is the man who raised me and it enrages me to imagine what he had to go through in the past six months. So how do I feel about all of this? Simple: he is innocent, and it is a continuous burden to see him behind bars when we all know he should be free. My father’s party has always been a secular moderate one and has made its views known to the public. The party’s stance during the uprising was simply a repetition of its stance prior to February 14. My father’s role in the uprising was educating the people on what a constitutional monarchy was. The government used the March crackdown as an opportunity to frame my father as a radical conspirator; they accused him of plotting to overthrow the regime with the help of people he didn’t even know. Radical was never in my father’s beliefs, but that’s what government sponsored propaganda, such as state television, is for. Imagine my fury when I heard there was a banner put up in three different neighbourhoods with pictures of political leaders, my father being one of them, the words “no pardoning” and a picture of a noose. The government successfully brainwashed some people into believing that he should be hanged. What world do we live in? Bahrain is very different now. A polarized society is not something I wanted to come back to. My father worked hard to provide us with a comfortable life. I am very lucky to be a part of the minority of Bahrainis who can afford certain luxuries. Being in this circle also means that a lot of people I grew up with will see things differently; if they are comfortable, why complain? I am flying back to continue my studies in a few weeks. 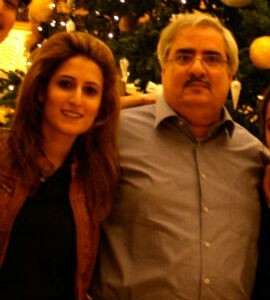 The day after my classes start is the day the judge will issue his verdict in Bahrain regarding my father’s case. I don’t know what to expect, but can you blame me with the current military court system we have? Overall, I am very proud of my father. He is, was, and always will be a strong and respectful figure in my life and I know in my heart that he will do great things for our country. It is just a matter of time, and patience is a virtue… or so they say. I’m not naïve, I just believe that good things are worth fighting for, and the suffering that the people went through, including my family, will justify the progress years from now. I have faith in a better Bahrain for all its citizens, regardless of their beliefs, and I know these hard times have made my family stronger. “Our freedom is in our dignity,” is something my father always says, and that is how I choose to summarize my life experience thus far. Testimonies from Bahrain: My father, the activist – Bahrain Freedom Movement.